Turkish gulets can be meant for sailing. Not all Turkish gulets are fully rigged to sail. One main reason is the number of crew. If there aren’t enough crew members – who are meant for service and not for handling the sails, then it may not always be possible to experience a full sailing holiday. 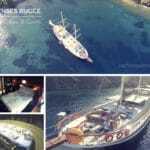 You will find that full sailing gulets are found in Bodrum. 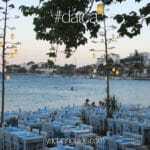 They are smaller in size, and some even participate in the annual Bodrum Cup – gulet regatta. 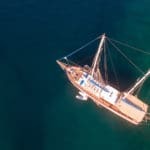 While many travelers who have never been on a gulet, but have seen the photos, may be under the impression that they all sail continuously during blue cruise holidays. Again, for sailing, there need to be enough crew members capable and knowledgeable to participate in the teamwork to get a gulet to sail. If there are more service-oriented crew personal and less for sailing, then the standard sailing option of 2 to 3 days per week might be possible with many gulets. In order to understand how many sailing guests can experience on board a gulet, is to discuss this subject with many charter agent and express their expectations. During a one week holiday, if the distances are long, and the time of year does not allow for continuous sailing in certain regions, sailing may not be possible every day. There are regions which provide better sailing conditions than others. Then there are times of the year where good winds are possible. Putting together this information, along with other client requirements may then honor the expectations of the guests on board. Alternatively, there are travelers who are excited by the thought of sailing. Then during their yacht charter Mediterranean vacation, the sails come out, the boat leans, and the feeling of sailing is not so welcoming to them. 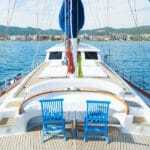 Therefore pleasant gulet cruises are preferred, which does provide a lovely “cruising in Turkey” experience.